Moo-Thru on a typical summer evening. Photo courtesy Google Maps. If you’ve driven on 29 between Charlottesville and D.C., you’ve probably seen the roadside dairy establishment with an overflowing parking lot and a seemingly endless drive-thru line. This is Moo-Thru, the saving grace of the Charlottesville–D.C. drive and the greatest idea conceived by a Virginian since the Declaration itself. The brainchild of a local dairy farming family that wanted to find a way out from under oppressively low milk prices, Moo-Thru offers the full gamut of dairy experiences: milk, chocolate milk, ice cream, soft serve, milkshakes, malts, and, at Christmastime, eggnog. My favorite is a good old-fashioned chocolate malt, but you really can’t go wrong choosing from among the dozen or so ice cream flavors. Being made on-site and from their own cows, the ice cream has a wholesome simplicity and sweetness to it reminiscent of some glorious, pre-froyo paradise. You won’t be able to escape the rich creaminess that evokes milk from Frisian Holsteins or even Jersey cows, and you won’t want to. Personally, I stop at Moo Thru every time I go to D.C. and usually on the way back, too. I once traveled all the way there just to get a milkshake. I feel not the least bit ashamed about it. Bonus: You can buy glass-bottled milk fresh—though still safely pasteurized—from the family farm here. Return the bottle and get two bucks back. Hey, it’s more than the book store will give you for that ridiculous deadweight of a Con Law book! Warning: Moo-Thru’s only fault is that it’s closed Mondays. If you’re going to drive all the way to Remington, I wouldn’t want you to suffer the near-existential despair that comes from seeing the “CLOSED” sign illuminated on their windows. That sound you just heard was the collective sneering gasp/head explosion of every one of our Law School classmates who considers themselves too good for wholesome Americana. I won’t back down: Dairy Queen is an American treasure. “Soft serve” were actually my first two words, and I’ve been a card-carrying member of the Blizzard Club since September of 2011, viz., a few short months after I turned 16 and first obtained a driver’s license. Fortunately for Charlottesvillains, there are two Dairy Queens close by; both the Earlysville and Crozet locations are an easy drive from the Law School. Stop through and get a classic Dilly bar, a delectable dipped soft-serve cone, or the timeless Blizzard. Mint Oreo is my favorite Blizzard flavor, though you can hardly go wrong with any of the candy-based options. I’m a little more skeptical of the Royal Blizzard, a recent innovation involving soft serve surrounding solid cores of chocolate and fruit. But hey, if that’s your thing, it still beats some tasteless froyo that costs you $5.50. Best of all, dairy here is extremely reasonably priced. You can walk out of DQ with more sugar-based calories than our ancestors could have dreamt of for, like, three bucks. Bonus: Ice cream cakes are among the greatest of God’s gifts to our society in these latter, shrunken days. Revel in the memory of youthful birthday parties with one of DQ’s Oreo ice cream cakes, or remind a friend turning thirty that life used to be fun. Warning: At the risk of sounding like an elitist hypocrite, the Crozet DQ is actually in a gas station, and unlike Bel-Air, this gas station lives up to the unpleasant stereotypes around gas stations. While the soft serve is still delightful and the Blizzards thick and inspiring, the floor’s a little gross and it smells like those fried taquito things they call “Hurricanes” or whatever. Ye be warned. 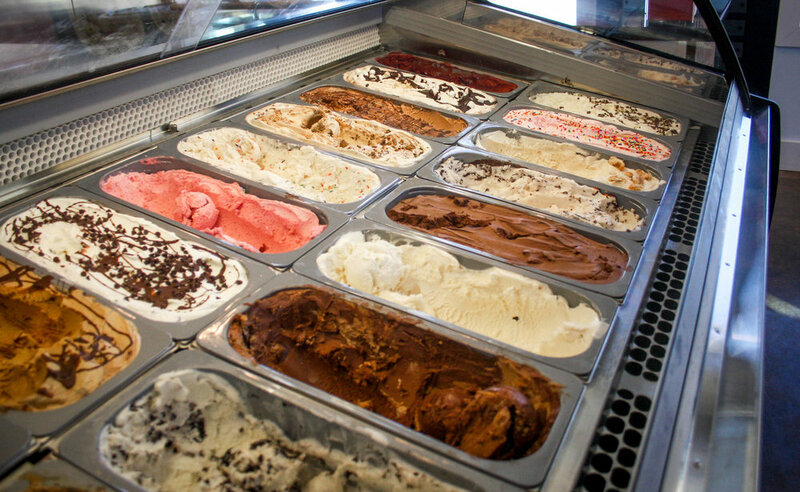 Just some of the classic flavors available at Crozet Creamery. Photo courtesy Crozet Creamery. I owe this find to a certain bearded LRW professor whose name rhymes with “Doe Shore,” who spoke eloquently and truly when he called it “really good.” I trekked out to a newish-looking building by the library in Crozet this weekend to enjoy a waffle cone of apple pie ice cream, and I wasn’t disappointed. The shop’s website boasts that ice cream here is made “in small batches from scratch daily,” and I believe it. My ice cream had sweet, caramelized apple chunks mixed into a vanilla-ish ice cream that tasted fresh out of the churn. The flavor was noticeable but not overpowering, and the somewhat non-homogenous texture reminded me of the hand-churned ice cream my family used to make in the summers. At the risk of using repetitive adjectives, this ice cream exemplified “thick” and “creamy,” which are precisely the qualities I look for in my nightly bowl of cream of ice. The shop was friendly—if a bit modern for my taste—with a wide selection of ice cream that included an intriguing Thin Mint that I almost went with before settling on apple pie. Crozet Creamery is the perfect place to visit to get out of Charlottesville with visiting friends or relatives to whom you want to prove that you do, in fact, occasionally leave the city limits. Pricing was a little, well, artisanal, which I understand to be a word that local places use as sort of shrugging attempt at mitigating sticker shock. Still, if you can afford the alcohol-tinged water at Bilt, I daresay you can buck up for a little dairy. Bonus: The outdoor seating is ideal for a warm evening. Given that Stephen T. Parr was up to his snowy antics again this weekend, I didn’t get the chance to enjoy it, but while I was rushing in out of the cold I noticed the sort of pristine view of the Blue Ridge I foolishly hoped I’d have the chance to enjoy before law school crushed my spirit. Warning: The man behind the counter was a little too friendly for my taste. Ice cream is a cold dish, and it demands a cold server, not some kind of flippant, merry-faced chuckler who wants to talk about the weather. If, like me, you seek to avoid grating small talk, I recommend working on your steely grimace to show him you mean business. Homestead Creamery – If you’re looking for store-bought ice cream, this is the stuff. Kroger sells it and its richness knows no bound. I’ve enjoyed both the Black Raspberry and Chocolate flavors. It’s a little pricey, but, you know, artisanal. Sub it in for a latte or whatever it is bourgeois urbanites drink these days. Arches – I haven’t actually been here (see introductory paragraph) but a couple locals threatened me with disembowelment if I didn’t mention it. If you absolutely must get frozen yogurt, you should probably go here and join the sea of listless, Vineyard Vines-clad undergrads in their saccharine, meaningless, flavor-bead-saturated paradise. Ben & Jerry’s – Free Cone Day was this Tuesday. Unless you needed PILA hours, you probably didn’t want to go anyway (see the above point about undergrads) but you can hardly go wrong paying a visit to this venerable American institution. It’s pricey, but where else can you get Cherry Garcia? You can’t get the milkshakes in the grocery store aisle, so a visit to the shop in Barracks is an occasional necessity. If you’re lactose intolerant, you should probably just not read any farther; we have nothing to say to each other. Double Hoos who remember all sorts of great places from undergrad, don’t @ me. This is a list for adults. This place is perfect for your late-capitalist guilt re: consumerism. You probably should not drink raw milk on the reg, no matter what your libertarian uncle tells you. See, e.g., everyone who complains about K-cup coffee, the people who won’t eat Bel-Air because it’s “in a gas station,” and pretty much everyone here from Connecticut. Please don’t be a douchebag and say “dilly dilly!” tho. Shout-out to the “bake a cake and get PILA hours” option that meant I only had to do eight shifts at the softball tournament this weekend instead of eleven.